All Islanders Gathering As One have come a long way from the first meeting we held in July of 2003. At that first meeting I remember some Samoan Elders who were present. They were happy and stated to us that they felt this small circle would grow. I also remember we started our first meeting with a prayer and have ever since - we believe that spiritual values are our foundation and that sacrifice and love are important in all our experiences and projects we attain. We believe in spreading the best information so that sound education helps us all address those issues we consider important to make a bigger difference in our daily lives. Towards that end we act as a team and support one another in the best possible manner. Our youth and Elders work as a team and it is this unique relationship without any high handiness that has taken us to a higher level of understanding and appreciation of each other. 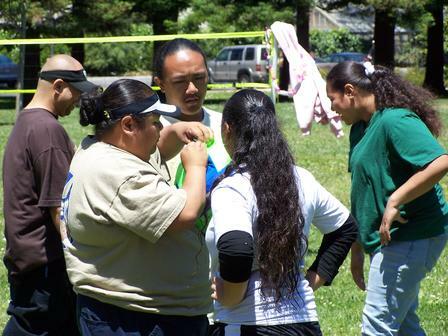 Recently we welcomed the Samoan youth from Southern California. Audrey Nauer and Natasha played an important role in the planning. The rest of us did what we could. We welcomed them on Friday May 28th, 2004 and planned events on Saturday, Sunday and Monday. Perhaps the highlight of the all the events was the BBQ event held at Memorial Orange Park in South San Francisco. It was fun watching the youth talk to one another, dance, and play. I was very happy to see the Elders and organizations such as UTOPIA support us as a family. The youth are our present leaders and I personally see a lot of talent that is just waiting to be shared. When we started nearly a year ago our youth from our group in San Francisco were timid. Today, they are willing to step up and share a good joke. They can carry this further and speak well on important issues. They love to dance and they have proved themselves as worthy singers and budding poets. The youth from Southern California mostly from Hawthorne and Carson City but also from San Diego were very friendly. I lost no time asking them questions but mostly listening to what they had to say. Our youth in San Francisco face trials and tribulations, daily they have to deal with the temptation of drugs and crime. Daily they have to stand up and decide if they can make a difference and they do. At every single meeting I am proud to announce to all that I am proud of our Samoan youth in our group - All Islanders Gathering As One. I can now add that I am very proud of the youth that visited us from Southern California. On Sunday May 30, 2004 the youth met and held a workshop from 10 a.m. to 4 p.m. They heard speakers motivate them. The also shared their views and watched a documentary. They listened and they shared and it was all very good. The teachers or chaperones that accompanied the youth from Southern California deserve our thanks and I personally admire their fortitude and tenacity to accompany the youth so that they could see how things are we their sisters and brothers - not far away and here in San Francisco. I spoke to the chaperones and some of them feel very good that they can influence the youth and make good stuff happen. We discussed ways to communicate and to use the best technology available to us to share information and work on projects that can carry the Samoan youth that dedicate their time to carry our singular aspirations to the highest level. We had many Samoan young women and men who were shy at first but I tried to tell them it is important for them to speak up and address issues that are common to us. Many a time we do not realize that society has brought so much pressure from the materialistic world that many of the traditional values that are important fall prey to that which is hollow, shallow, and empty. In Samoa nature teaches one many things and the sweet smell of the ocean breeze and traditional music and language imbibe certain astute and characteristics difficult to attain in a materialistic world such as America offers. It has been an issue on the horizon that has been hitting us closer every year - drugs, crime, and death. As with the general society the worse elements always come to roost with the best that are not fully aware of the poisons of drugs. Drugs lead to crime and crime to death. Those most precious to us are our children. We should not allow elements hostile to families, love, and nurturing to kill our children. Allow crime and factors that adversely impact the goodness of time tested traditional values fall prey to that which is mundane. It is senseless for us human beings, children of Almighty God, to allow those elements that we can keep at a distance to approach us and take a hold of us and destroy us. Our youth are leaders who should know the way, show the way and go the way. Marks of good leadership. I looked into the eyes of this one youth as we stepped away to talk. Why is it that no one cares to listen to our youth? Why do some of us macho men feel that our women cannot travel the high road and make the best things happen? I gave her my card and when she wants to communicate she can use the technology of cyber space and carry our small dialog to the highest level. Web sites can attain many goals if the information planted on the site contain good seeds. Just like the written word contained in the books on the shelves on many libraries today cyber space offers the same means but we can reach so many and make good stuff happen in nano seconds. We have our Mape, Andrew, Peter, Teresa and we gloat when they do us proud. You should have seen Andrew and Peter at Pier 39 on Sunday May 30, 2004 entertaining the crowd with song and spoken word with the other youth from Southern California joining them. Some months ago they were shy - today they make the world their stage and share the talents that are abundant. I mingled with the tourists at Pier 39 and some of them thought our youth belonged to some well known singing group. They sang well enough to gather a large crowd. I could hear the Samoan women-sitting close by singing in the background and encouraging the youth. It is these spontaneous support that make a difference. Our commitment to our youth in matters that have a vision should be encouraged with added vision and action. We look forward to working with the youth our sisters and brothers from Southern California. It may be possible that in the near future we may visit Southern California and check out stuff for ourselves. Just listening to the youth gives us hope. We look forward to better times and a growing relationship - towards that end we will do our best.